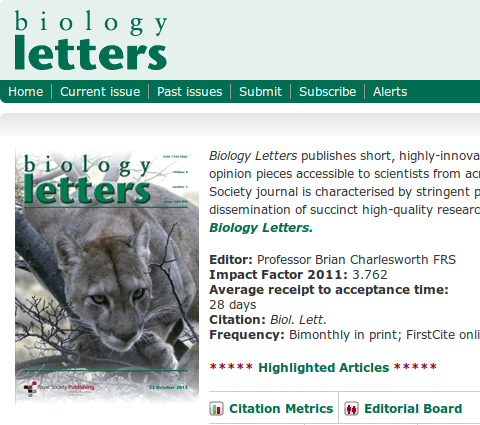 I just looked on the BL website, and the only infromation I could find was “Articles submitted to Biology Letters benefit from its broad scope and readership, dedicated media promotion and we aim for a turnaround time of within 4 weeks to first decision.” This sounds like a much more reasonable claim to make and one that would be harder to fudge. So it’s not just that false submission-to-acceptance dates are given on individual papers; but the false average is used as a promotional tool. I remember one of my friends pulling his hair over this a while back. I don’t think Biology Letters was the culprit, but it doesn’t matter; stating average acceptance times that have little to do with the real situation just breeds unnecessary frustration and may make authors think twice before submitting their next manuscript to the same journal. In other words, the journal is essentially shooting itself in the foot in the long term by providing authors with inaccurate information. Right. Given that journals stand or fall by their reputation with academics, it’s a horribly short-sighted strategy to buy impressive statistics by lying. But then since the Royal Society is run for, and largely by, academics, you’d think they’d know that. Ummm…isn’t 28 days 4 weeks? Yes, it is. I don’t understand what your point is.